The Hill newspaper today features Cassidy’s newest vice president Chad Sydnor in its Tuesday Profile series that spotlights some of Washington’s top influencers. 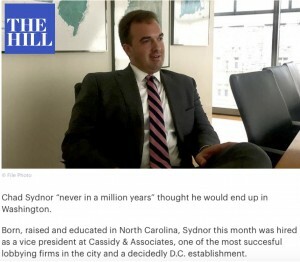 Sydnor this month was hired as a vice president at Cassidy & Associates, one of the most succesful lobbying firms in the city and a decidedly D.C. establishment. The company counts among its clients defense and technology powerhouses Palantir, BAE Systems, Airbus and Cerner. The last was just named the creator of the Department of Veterans Affairs’ new electronic health records system, a multibillion-dollar undertaking. Sydnor, 37, cut his own teeth on defense policy on Capitol Hill, serving most recently as military legislative aide (MLA) to Sen. Richard Burr (R-N.C.). He held similar roles under Sen. John Boozman (R-Ark.) and Rep. Joe Wilson (R-S.C.). His experience is sure to be helpful in his new lobbying role amid a particularly decisive time on Capitol Hill. Congressional defense hawks are pushing back at a young administration, saying its proposed budget falls woefully short on military and homeland security spending. Sydnor’s new portfolio largely deals with his bread and butter from Capitol Hill: defense, intelligence, cybersecurity and veterans’ healthcare issues. He says he has his eye on the top lines for defense spending in the fiscal 2018 National Defense Authorization Act. Read the complete Tuesday Profile here.